Today is Fashion Revolution Day- a day to remember the Rana Plaza collapse in Bangladesh just one year ago, and a day to ask the question, "Who made my clothes?" A day to bring awareness to sustainable fashion and make us all think a bit about where our clothes come from, and who makes them, and how they are made. Because it matters. And if you don't know why yet, watch this five minute op-doc about the Rana Plaza collapse. It's good. Really good. I've had sustainable fashion on my mind for a bit now, ever since I came across this article- 6 Things You Should Know About Your Clothes- in my facebook feed. 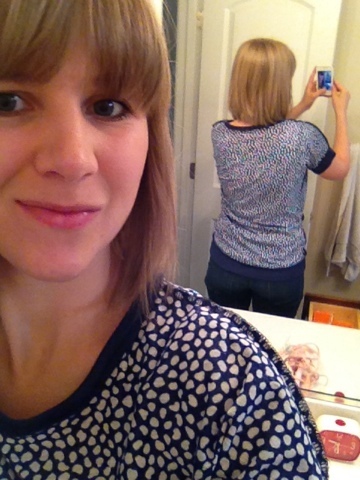 (You should really read it, and the follow up post, 4 Things You Should Remember Every Time You Shop for Clothes). Here's the thing- I've always been a seeker of bargains. I pride myself on finding a good deal, but this article made me rethink the cost of those "deals.' I'd started to see the light on quality over quantity (as a twenty something who naturally wants ALL THE THINGS this is a slow going change) but I'm more committed to that change every day, as I'm learning about the options I have as a consumer. I'm on a tight budget, which means I can't afford to buy all organic cotton, sustainably sourced, ethically made clothes for myself and my family. 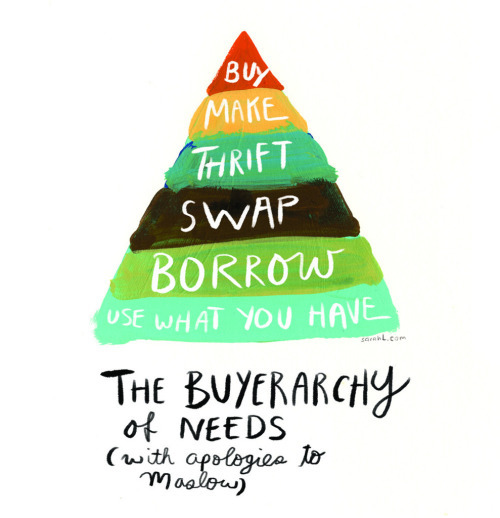 I'm using this fantastic and lovely graphic by Sarah Lazarovic, along with the ideas in the articles linked above, as my guide to navigating a more ethical wardrobe, on a budget. 1. I'm gonna use what I got. When I look through my closet there are always those things that I pass by because they don't fit just right, or a button needs to be replaced, or there is a hole somewhere. Well guess what- clothes can be fixed! Mending and alterations can extend the life of clothes you already have. I do mine myself, but when I don't know how I usually search the internet for a tutorial or video. If you want to learn how, the information is there! And if you don't want to learn how, find a tailor or someone who can do the work for you. Costs range on this quite a bit, but it never hurts to ask, right? Matt and I both had holes forming in the crotch of our jeans a few months back. I finally convinced myself to try patching them because we just couldn't afford new ones at the time. That was 5 months ago, and we are both still wearing them with no signs of them wearing out, and the patches aren't even visible! 2. I'll borrow and swap when I can. I don't have a clothes borrowing friend near me now, but when I did I loved it. For family pictures or a special occasion, raiding a friends closet can give just the extra something you want without purchasing anything. I've also borrowed maternity clothes. Pregnancy can be a tricky time for clothes, so borrowing makes so much sense. Something you wear one week may look terrible or not fit the next, so borrowing from others was a great way for me to have a wardrobe I wasn't sick of by the end of my pregnancy. Oh, and kids clothes? Borrowing saved us from having to buy a new infant wardrobe, since my girls were born in opposite seasons. Moving forward I'll try to lend more, too. 4. Make, make make! Wearing something I've made makes me happy. Seeing my girls wearing something I've made makes me happy. I haven't tried it yet, but I'm betting seeing Matt wearing something I've made would make me happy. I'm going to try to add to all of our wardrobes with handmade when I can, using lots of thrifted materials, and try to use patterns by indie designers (my fave!) whenever possible. For anyone who doesn't sew but wants to, the online sewing community is one of the nicest and most helpful out there! There are tutorials! Patterns! Bloggers galore! So many resources to help anyone, at any skill level, hone the skills needed to sew. It doesn't take a special talent, just patience and practice. If you've ever thought about learning to sew, DO IT! 5. I'll put my money where my mouth is. Yes, I'm sure I'll still be buying lots of things, but I'll try to do a little research and buy less 'fast fashion' and more quality products from companies who treat their makers well. Because I sew, so I know the skill it takes to make clothing. I want to show, with my dollars, that I value that skill in the global market. I'm not promising to only buy from a certain company, or to only buy organic, but I am going to be a more conscientious consumer. Because it matters. So what about you- how are you going to be part of the fashion revolution?